Phoenix, Arizona rockers Greeley Estates got recognition by staying as an unsigned band for months in the top 10 at PureVolume, gathering over one million plays. A small label decided to sign them and have them release two CDs and one EP. Their third album, Go West Young Man, Let The Evil Go East, has now been published by the bigger Ferret Music. Although unfamiliar with the band’s past, it seems that their new material is heavier, darker and more aggressive than their previous ones. This might be due to the numerous line-up changes. Even now there are members who weren’t yet in the band when the present album was recorded. 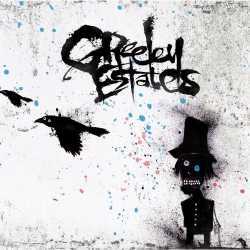 Greeley Estates use as the basics of their sound trendy metal core, but then add some more. For one thing, there are many breaks and a lot of variety, making sure that no song starts at the same speed as it ends. The majority of the songs are kept at a rather hectic pace, with fitting emo and screamo vocals, but there is often room for melodic moments. Despite their aggressive take, the choruses sometimes surprise with adequate catchiness, especially on In The Ashes and Mother Nature Is A Terrorist. Even stranger are the pop choirs that we are normally only used from obnoxious boy groups. The optimal production helps to emphasise the sound even further. Greeley Estates aim at an audience which is probably only half my age, but I have to admit that their approach is smarter than those of many of their contemporaries. Go West Young Man, Let The Evil Go East hits the current zeitgeist right in bull’s eye, and I am certain that many teenagers, and maybe also a few older people, will come to value this intense piece of music.